60 artists from 14 countries, more than 100 masterpieces coming from major international collections to tell a contemporary urban art history. The ‘80s, New York graffiti form the Bronx. 2000, Europe-USA, the urbanists. 2010, Internet and the Globalists. Based on these three sections, exhibition follows the visual art practice urbanisation of the last 30 years, selecting the most relevant and influential artists from all over the world able to conquer both popularity and international market. From New York ‘80s graffiti legends like Rammellzee, Futura2000 or Dondi White, to Urbanists like Vhils, Obey, Invader, 108, Swoon, Sten-lex, Moneyless who opened a path to street art as we know it today to recent Globalists like Interesni Kazki, Alexis Diaz or Jaz that let a new renaissance explode 10 years later thanks to the internet. Fondazione Terzo Pilastro – Italia e Mediterraneo and 999Contemporary are pleased to present the work of the Portuguese artist Vhils donated to the city of Catania aiming at revitalising the waterfront of the port and the exhibition Source Codes – Contemporary Urban Visions, curated by 999Contemporary, at Palazzo Platamone from 17th December 2015. The commitment of Fondazione Terzo Pilastro – Italia e Mediterraneo to witness and celebrate the culture of its time is involving once again Sicily, in particular the city of Catania which has already been the scene of several important initiatives of this institution. Considered as a Mediterranean hub from the dawn of our civilisation, the city of Catania has always been a “safe haven” for different cultures, ethnicities and religions crossing their routes and in order to celebrate this ancient and noble function, the Fondazione donates to this city a monumental work, the largest mural in the world, depicted by one of the most important contemporary urban artist, the Portuguese Alexandre Farto, aka Vhils. Beyond this public artwork, Fondazione Terzo Pilastro – Italia e Mediterraneo has strongly advocated for Catania to be the first step of a major innovative exhibition on the story and origin of Street Art, the artistic movement that is conquering the world, which will travel all around Europe over the coming months. The biggest gaze on the sea that humanity has ever painted: this is the gift of the Fondazione Terzo Pilastro to the city of Catania and the whole Sicily. The President of the foundation, Emmanuele F.M. Emanuele, strongly advocated it and Alexandre Farto, aka Vhils, made it. The Portuguese artist was born and raised in Lisbon, son of a city glazing out since centuries to the whole ocean. As tall as a ten-storey building, as wide as a football field: these are the gigantic dimensions of the portrait raising out as a monolithic from the water off the port of Catania, painted on the eight grain silos in cement defining since 1960 – along with Etna and baroque domes – the skyline of the Etna-shadowed city. A man looking at the sea. But who is that figure? It’s not important. It is One, No One and One Hundred Thousand. At the port of Catania an old fisherman told us that when we look at the sea happiness becomes a simple idea. Which critical apparatus, which speculative mechanism can explain the meaning of Vhils’s work better than it’s simplicity? The choice fell on the greatest gaze to the sea that a man has ever painted on the Sicilian coasts: it crosses the Mediterranean gazing out to the East, embracing Greece, Cyprus, Turkey, Egypt, Syria, Jordan, Israel, Lebanon, the lands from where the people who made the Sicilian history started their adventures. Beyond the clashes of civilisations, the hope is that people could be aware there is now a bridge they can all cross, if they just want it. New aesthetic, stylistic, semantic codes arise from the urban culture of the last thirty years to define a new urban art scene in which art absorbs the wide metropolitan dimensionality fitting into its scale. It’s Street Art, which is taking over cities through the extra dimensions of its imagery, imposing with success its popular languages, bringing art into the lives of ordinary people, frustrated by labels and definitions. From the giants of graffiti scene who produced a sort of vibration in the New York of the ’80s, to the most important exponents of the new street-art generation: they are for the first time all gathered in a historical, linear, unique narrative – never performed before – and they tell the path driving Street Art to be the first global art movement of the entire art history, as well as the most actively large-scale experienced. The exhibition is an anthology of the most important works of the creators of an artistic spontaneous and non-academic path, representing 30 years in which the artistic experience reacted to the contemporary cultural polarisation, winning the favour of the global audience. In one single exhibition it will be possible to appreciate the vision of the masterpieces of all the artists who mostly influenced the contemporary global visual culture, from graffiti artists of the New York of the ’80s, to the latest generations, for the first time all gathered in a single narrative, never exhibited before, showing the viewer the path that brought the so-called Street Art to become the global art movement that will tell the posterity the world as it was at the time of the first globalisation. Divided into three sections telling the birth, the interactive development and the phenomenon consecration, the SOURCE CODES exhibition shows, for the first time, the works of iconic contemporary artists, gathering them all together: 108, A One, Augustine Iacurci, Alexis Diaz, Alexone, Bo 130, Boris Tellegen (aka Delta), Brad Downey, C215, Clemens Behr, Conor Harrington, Crash, Delta 2, Dondi White, Doze Green, El Seed, Ericailcane, Eron, Escif, Evol, Faile, Feitakis, Gaia, Herbert Baglione, Horfee, Inetresni Kazki, Invader, Jaz, Jeff Aerosol, Jenkins, Jonone, JR, Judith Supine, Kool Koor, The Atlas, Lek & Sowat, Lucy McLauchlan, Matt Small, Maya Hayuk, Mensanger, Miss Van, Momo, Moneyless, Peeta, Rammellzee, Retna , Roa, Seth, Philippe Baudelocque, Sharp, Shepard Fairey, Sten-Lex, Swoon, The London Police, James Todd, Toxic Vhils. The works coming from the most important international private collections, represent a unique event in the current exhibition scene, providing a teaching and warning message: “In a world increasingly showing the expression of its uniformity” as explained by Stefano S. Antonelli, the curator, ”we could not defend the richness of diversity if we don’t promote it to the rank of value, that is framing it as a thought category. These contemporary artists embody their awareness and hope reacting to this regressive process. They are those who have understood that the necessary work is to push forward their roots in various heterogeneous formats and contexts, denying them the possibility to fully define our identity. A work which is still in progress, having as fundamental principle: it’s better to exchange than to impose”. Strongly supported by the Fondazione Terzo Pilastro – Italia e Mediterraneo, the exhibition will be open from 17th December 2015 to 18th January 2016, at Palazzo Platamone, in Catania. Palazzo Platamone, kindly offered by the city of Catania, represents the secular evolution of the history of the city from the late Middle Age to the Renaissance until the modern renovation. It’s the ideal exhibition place, provided thanks to the active collaboration of the Assessorato ai Saperi e alla Bellezza Condivisa di Catania and to the Associazione Emergence di Giuseppe Stagnitta. 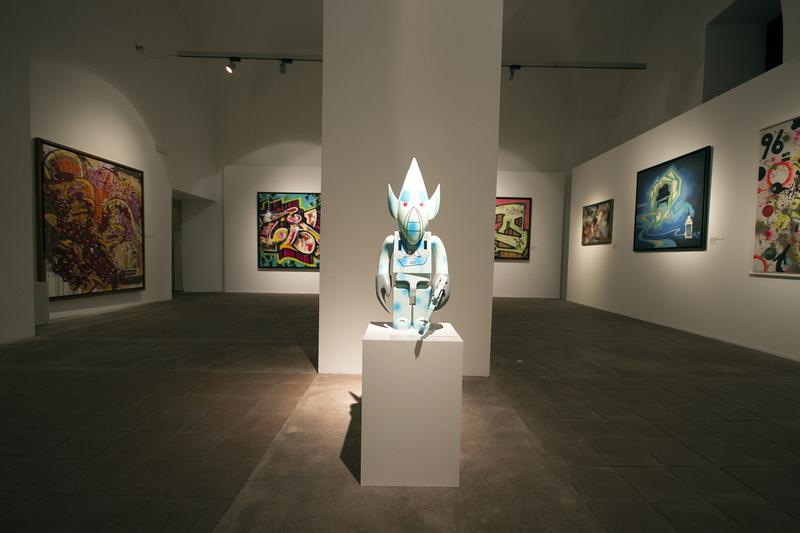 “I’m very glad to finally bring to Sicily – through two different but complementary initiatives – the experience of Street Art, a phenomenon that I could appreciate in my younger years living in Los Angeles and Miami, being immediately aware of its far-reaching nature” says the President of the Fondazione Terzo Pilastro Emmanuele F.M. Emanuele” This is – in its more mature expression- a new artistic movement of great vitality and effectiveness in terms of communication, as demonstrated by the successful experience we have recently supported in Rome, called Big City Life, created in Tor Marancia neighborhood – a site which is being visited today more than the greatest museums of the City – and the similar project made in Arezzo – also with our support – within the important international exhibition “Icastica”. Street Art combines perfectly with my inner awareness that art applied to the territory is the main tool to combat degradation and to make beauty accessible by all. 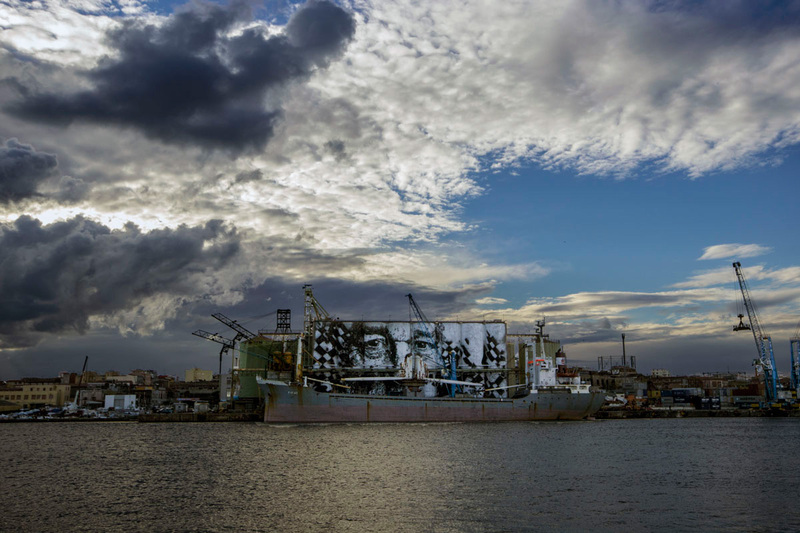 That is why I am particularly proud to combine such an important exhibition, unique in its kind, to the “gift” of the artist Vhils, at Catania harbour: a place of exchange, contamination, life, work and openness to new shores and lands “. The hybridisation of languages, the re-programming of the imaginary and the re-location of the values are the “Source Codes” building the basis of a new global artistic action used as a leverage to nullify the monoculture-oriented drift generated by the economic globalisation. A great exhibition which becomes awareness and vision of hope. 60 artisti da 14 paesi, oltre 100 capolavori provenienti dalle più importanti collezioni internazionali per raccontare l’arte urbana contemporanea. Anni ’80, New York e i Graffitisti del Bronx. Anni 2000, Europa-USA: gli Urbanisti. Anni ’10 del nuovo millennio, Internet: i Globalisti. Queste le tre sezioni in cui si articola la mostra che ripercorre l’urbanizzazione dell’esperienza artistica degli ultimi trent’anni selezionando i talenti più importanti e significativi che hanno saputo conquistare sia il grande pubblico che il collezionismo internazionale. Da vere e proprie leggende della New York anni ‘80 come Rammellzee, Futura2000 o Dondi White agli urbanisti come Vhils, Obey, Invader, 108, Swoon, Sten-lex, Moneyless che nel 2000 aprono la strada alla street art che conosciamo oggi per arrivare ai Globalisti come Interesni Kazki, Alexis Diaz o Jaz che dieci anni dopo fanno esplodere un nuovo rinascimento globale grazie ad internet. Vhils, Catania. Work in progress. 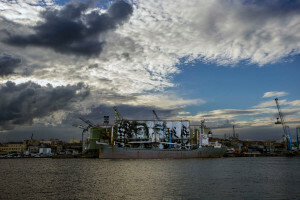 La Fondazione Terzo Pilastro – Italia e Mediterraneo è lieta di presentare l’opera dell’artista portoghese Vhils donata alla città di Catania per la riqualificazione del waterfront del porto e la mostra CODICI SORGENTI – Visioni Urbane Contemporanee a cura di 999Contemporary presso Palazzo Platamone dal 17 Dicembre prossimo. L’impegno della Fondazione Terzo Pilastro – Italia e Mediterraneo di testimoniare e celebrare la cultura del proprio tempo ancora una volta approda in Sicilia, nella città di Catania che è stata già teatro di numerose importanti iniziative di tale istituzione. Presidio mediterraneo dall’alba della nostra civiltà, la città di Catania è da sempre un felice approdo per le diverse culture, etnie e religioni con cui ha incrociato le rotte, e proprio per celebrare questa antica e nobile funzione la Fondazione ha voluto donare alla città un’opera monumentale, il più grande dipinto murale al mondo, chiamando a realizzarlo uno dei più importanti artisti urbani contemporanei, il portoghese Alexandre Farto, in arte Vhils. Oltre all’opera pubblica, è desiderio della Fondazione Terzo Pilastro – Italia e Mediterraneo che proprio la città di Catania si la prima tappa di una grande mostra inedita sulla storia e l’origine della street art, il movimento artistico che sta conquistando il mondo, che girerà l’Europa nei prossimi mesi. Il più grande sguardo sul mare che l’umanità abbia mai dipinto: è questo il dono della Fondazione Terzo Pilastro alla città di Catania e alla Sicilia tutta. A volerlo, il Presidente della fondazione Emmanuele F. M. Emanuele, a realizzarlo Alexandre Farto in arte Vhils, artista portoghese nato e cresciuto a Lisbona, figlio di una città che posa il suo sguardo da secoli su un intero oceano. Alto come un palazzo di dieci piani, largo come un campo da calcio: queste sono le dimensioni ciclopiche del ritratto che sorge monolitico dall’acqua antistante il porto di Catania, dipinto sugli otto silos granari in cemento che dal 1960 definiscono, insieme all’Etna e alle cupole barocche, lo skyline della città etnea. Un uomo che guarda il mare. Ma chi è quella figura? Non è importante. È uno, nessuno e centomila. Al porto di Catania un vecchio pescatore ci ha detto che guardando il mare la felicità diventa un’idea semplice. Quale apparato critico, quale dispositivo speculativo può spiegare meglio della semplicità dell’opera di Vhils il suo stesso significato? La scelta è caduta sul più grande sguardo verso il mare che l’uomo abbia mai dipinto sulle coste della Sicilia: esso attraversa il Mediterraneo e guarda ad Oriente, abbraccia la Grecia, Cipro, la Turchia, l’Egitto, la Siria, la Giordania Israele, il Libano, le terre da dove sono partiti i popoli che hanno fatto la Sicilia. La speranza é che gli uomini sappiano che al di là dei tumulti delle civiltà esiste un ponte che tutti, se vorranno, potranno attraversare. Nuovi codici estetici, stilistici, semantici sorgono dalla cultura urbana degli ultimi trent’anni per definire un nuovo panorama artistico urbano in cui l’arte assorbe la dimensionalità metropolitana per esprimersi alla sua misura. E’ la street art, che si impossessa delle città attraverso l’extradimensionalità delle sue rappresentazioni, che impone con successo i suoi linguaggi popolari, che porta l’arte nella vita delle persone comuni, insofferente alle etichette e alle definizioni. Dai mostri sacri del graffitismo che ha fatto vibrare la New York degli anni ’80 ai più importanti esponenti della street art di nuova generazione: per la prima volta raccolti in una narrazione storica, lineare, unica e mai rappresentata prima, raccontano il percorso che ha portato la street art a diventare il primo movimento artistico globale e il più partecipato dell’intera storia dell’arte. La mostra è un’antologia delle più importanti opere dei creatori di un percorso artistico spontaneo e non accademico, rappresentante i 30 anni che hanno visto l’esperienza artistica reagire alla polarizzazione culturale contemporanea conquistando il favore del pubblico globale. In un solo progetto espositivo sarà possibile calarsi nella visione dei capolavori di tutte le figure che hanno maggiormente influenzato la cultura visiva globale contemporanea, dai graffitisti della New York degli anni ’80 alle nuovissime generazioni, per la prima volta raccolta in una narrazione unica e mai rappresentata prima che mette sotto gli occhi dello spettatore il percorso che ha portato la cosiddetta street art a diventare il movimento artistico globale che racconterà ai posteri il mondo all’epoca della prima globalizzazione. Divisa in tre sezioni che raccontano la nascita, sviluppo interattivo e consacrazione del fenomeno, CODICI SORGENTI mostra per la prima volta insieme le opere di artisti iconici della contemporaneità: 108, A One, Agostino Iacurci, Alexis Diaz, Alexone, Bo 130, Boris Tellegen (a.k.a. Delta), Brad Downey, C215, Clemens Behr, Conor Harrington, Crash, Delta 2, Dondi White, Doze Green, El Seed, Ericailcane, Eron, Escif, Evol, Faile, Feitakis, Gaia, Herbert Baglione, Horfee, Inetresni Kazki, Invader, Jaz, Jeff Aerosol, Jenkins, Jonone, JR, Judith Supine, Kool Koor, L’Atlas, Lek&Sowat, Lucy Mclauchlan, Matt Small, Maya Hayuk, Mensanger, Miss Van, Momo, Moneyless, Peeta, Rammellzee, Retna, Roa, Seth, Philippe Baudelocque, Sharp, Shepard Fairey, Sten-Lex, Swoon, The London Police, Todd James, Toxic Vhils. Le opere, provenienti dalle più importanti collezioni private internazionali, costituiscono un’unicum nel panorama espositivo attuale che diviene insegnamento e monito: «In un mondo che s’uniforma ogni giorno di più» spiega il curatore Stefano S. Antonelli «non potremmo difendere la ricchezza della diversità se non innalzandola a livello di un valore, cioè costituendola come categoria di pensiero. Questi creatori contemporanei incarnano la coscienza e la speranza reattiva a questo processo involutivo, coloro che hanno compreso che il lavoro necessario è quello di mettere in cammino le proprie radici in contesti e formati eterogenei negando loro la possibilità di definire completamente la nostra identità. Un lavoro tutt’ora in corso che ha come principio fondante: scambiare piuttosto che imporre». Fortemente voluta dalla Fondazione Terzo Pilastro – Italia e Mediterraneo, la mostra sarà visibile dal 17 Dicembre 2015 al 18 Gennaio 2016 al Palazzo Platamone di Catania. Palazzo Platamone, gentilmente concesso dal Comune di Catania, rappresentante l’evoluzione secolare della storia della città dal tardo medioevo al rinascimento fino al recupero moderno è sede ideale dell’esposizione, individuata grazie al supporto attivo dell’Assessorato ai Saperi e alla Bellezza Condivisa di Catania e all’Associazione Emergence di Giuseppe Stagnitta. «Sono molto felice di portare finalmente in Sicilia, e con ben due iniziative distinte ma complementari fra loro, l’esperienza della street art, fenomeno che ho conosciuto nei miei anni giovanili, a Los Angeles e Miami, e di cui ho subito compreso la portata» afferma il Presidente della Fondazione Terzo Pilastro Emmanuele F. M. Emanuele «Si tratta, nella sua espressione più matura, di una nuova manifestazione artistica di grande vitalità ed efficacia comunicativa, come ha dimostrato la felice esperienza, da noi sostenuta, di Big City Life a Tor Marancia a Roma, quartiere che oggi è più visitato dei grandi musei, e quella analoga realizzata ad Arezzo – anch’essa con il nostro sostegno – nel quadro della grande rassegna di arte internazionale “Icastica”. La street art sposa perfettamente la mia sensibilità di fare dell’arte applicata al territorio lo strumento principe per combattere il degrado, e per rendere la bellezza fruibile da parte di tutti. Ecco perchè sono particolarmente fiero di affiancare ad una grande mostra, unica nel suo genere, il “dono” dell’artista Vhils al porto di Catania: luogo di scambio, di contaminazione, di vita, di lavoro, di apertura verso nuove coste e nuove terre». L’ibridazione dei linguaggi, la riprogrammazione degli immaginari e il riposizionamento dei valori sono i “codici sorgenti” che hanno presidiato alla fondazione di un nuovo agire artistico globale utilizzato come dispositivo per disinnescare la deriva monoculturalista avviata dalla globalizzazione economica. Una grande esposizione, che diventa presa di coscienza e visione di speranza.